There had been a few "human extinction" films around with some merit, but far too many that sucked. Danny Boyle, director of Trainspotting and The Beach, made some serious decisions in tackling this project. First of all, making a movie that can be seen as merely a zombie survival film, and secondly shooting it on digital video. Well in the first case, even if it is, great! I can't resist a good zombie flick and if this is what some want to call it, fine by me. The digital format gives the picture a surreal look in the transfer for cinema but on video, the high definition picture actually does not look like that of a TV programme). A borderline video look in fact gives the horror an even more realistic appearance in the absence of the film grain's artistic look. The plastic video texture is minimal. The UK is laid in ruins after a rampant infection turns normal people on one another, savagely killing, maiming and spreading the infection. Jim, a young cycle messenger, wakes up in the hospital, having been in a coma while this catastrophe caught on over 28 days, laying the densely populated London to waste. Dazed, confused and dumbstruck, he can't find a living soul. Scenes of our loner wandering the empty, desolate and littered London streets are amazing, taking some serious co-ordination. The infected are vicious, scary, deadly monsters with an insatiable bloodlust, a single bite or scratch and it's a matter of minutes before you're one of them. When two survivors save him from becoming lunch to a gang of infected, their journey of survival brings them to a man and his daughter who believe there is a way out. The predominantly unknown cast is great as they resort to basic survival instincts, even in the face of hopelessness. 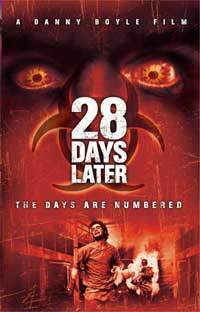 28 Days Later is an amazing hypothetical scenario with chilling scares, moral dilemmas, gruesome horror and practical as well as philosophical issues. It is an absolute disgrace that this great piece of cinema received such a short theatrical run in South Africa. Hopefully more people will get to witness this chilling movie on its video & DVD release.